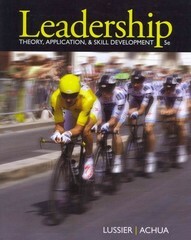 Leadership 5 Edition The most practical leadership textbook on the market, LEADERSHIP 5e, uses a unique three-pronged approach to teach leadership concepts and theory, and takes students to the next level by developing their competencies in applying the concepts and development leadership skills they can immediately start using in their personal and professional lives. The authors combine traditional theory with cutting-edge leadership topics in a concise presentation that is packed with real-world examples. The text constantly puts the student in the leadership role engaging them in applying the concepts, as well as providing step-by-step behavior models for effectively handling leadership functions. LEADERSHIP's innovative three-pronged approach provides the greatest array and quality of learning opportunities.